On July 17, eight Republican legislators, including Assemblyman Jordan Cunningham (R-San Luis Obispo), broke rank with their party and voted for the cap-and-trade bill. Launched in 2012, cap-and-trade is a controversial program designed to lower greenhouse gas emissions that requires many industrial companies to garner permits for emission allowances. Companies can purchase the permits from other businesses or from auctions held by the California Air Resources Board. Portions of the costs are then passed on to taxpayers. Many Republicans view the program as a tax hike and a burdensome regulatory scheme. In the aftermath of the vote, anger toward the Republicans who supported the bill has erupted at town halls and tea party gatherings. At a state tea party event in Fresno over the weekend, former Assemblyman Tim Donnelly called on Republicans statewide to take down Republican Assembly leader Chad Mayes, who voted for the cap-and-trade bill. Mayes has faced at least one challenge over his leadership position since last month’s vote and more challenges may come. It would take a majority vote of the California Assembly Republican Caucus to oust Mayes as the group’s leader. In addition to anger over the vote, there has been outcry over Mayes and other Republican legislators being photographed with Gov. Jerry Brown on the day the cap-and-trade bill passed. Mayes posed for a photo that day in which he is seen smiling in between Brown and the Democratic leaders of both the Assembly and state Senate. One of the July 17 photos captured Cunningham speaking with Brown. Cunningham did not appear to be posing in the picture though. 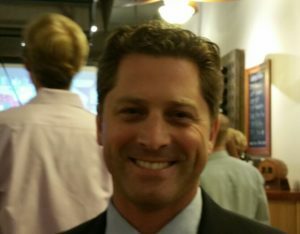 Cunningham defended his vote for the cap-and-trade bill by releasing a statement saying the legislation will reduce taxes and aid California businesses. Other Republicans have defended the vote as a needed compromise, saying California is overwhelmingly supportive of measures to combat climate change, and the minority party ought to have some say over how the cap-and-trade funds are spent. A recent poll conducted by the nonpartisan Public Policy Institute found that more than half of Californians had never heard of the cap-and-trade program. Once the program was described to them, 56 percent of those polled said they supported it, including 54 percent of decline to state voters and 32 percent of Republicans. The same poll indicated nearly 75 percent of Californians support a 2016 law requiring the state to reduce greenhouse gas emissions to 40 percent below 1990 levels by 2030. Anyone that votes for this is not looking out for you. I want the people who say they saved us 16 Billion to print out a itemized list of the savings and what programs are illuminated to get those savings.With the added gas tax and vehicle registration fees that will probably bring in 10 fold the amount of any cuts so there really are no cuts. Awhile back politicians said marijuana was bad and would lead to more people using hard drugs but now it’s OK. because they see all the extra dollars it will bring. It’s all about money and the government smoke and mirrors continues on.